Darren and Gary Barker were the Fabulous Barker Boys. As amateurs, Darren won a Commonwealth Games gold medal while Gary, four years younger, won a Junior Olympic Games title.Then sadly, cruelly, Gary's life was cut short in a car accident when he was just 19, devastating the Barker family. 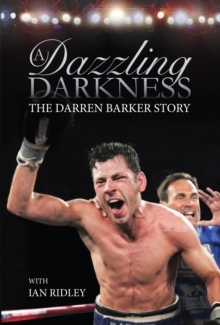 Darren could not face boxing again.Inspired, however, by a brilliant therapist and mentored by a sympathetic trainer in Tony Sims, who had his own story of tragedy and loss, Darren got back into the ring and worked his way up to a world title shot. After first losing to the legendary Argentine, Sergio Martinez, and undergoing two hip operations, Darren finally returned to Atlantic City to wrest the IBF world title from the Australian Daniel Geale. A DAZZLING DARKNESS is written in collaboration with Ian Ridley, Sports Journalist of the Year in the British Press Awards 2007 and author of the best-selling Addicted, the autobiography of the former Arsenal and England captain Tony Adams. It is story of triumph out of tragedy, hope from despair, achievement from adversity.